What is Roof Flashing for? Home » Don Schmidt Roofing Blog » What is Roof Flashing for? Flashing helps direct the flow of water around openings. Since water can seep into your home’s walls, deteriorating building materials, causing structural damage, and creating moisture and mold problems, it is very important to properly install flashing when constructing a new house or altering the exterior of a house. Flashing is used beneath the first course above ground level in a masonry building, above all wood trim on shelves, doors, and windows, where exterior stairs and decks attach to the house, and around any features in the roof structure. Flashing can be made of sheet metal, plastic or composite materials. 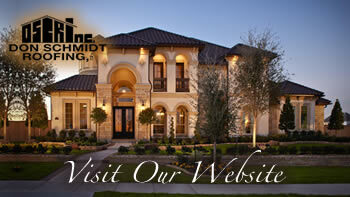 Sheet metal flashing is the most durable, and usually the most expensive choice. Copper or stainless steel can be used as flashing. Plastic flashing, usually PVC-based, is a less expensive alternative to metal, but if parts are exposed, it can wear with direct sun contact. Metal flashing is usually chosen for dormer windows. Flashing squares are inserted between each row of roofing material. Flashing can also be used as a strip that runs around the dormer and under the roofing material. Unlike other windows in your home, the flashing is also extended into a front apron, which overlaps the roof material. As dormer size and window style vary from house to house, the details can be different for your house.